For other people named Joe Collins, see Joe Collins (disambiguation). 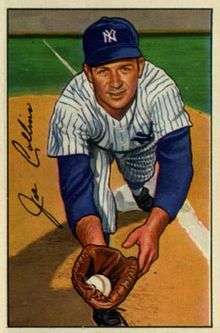 Joseph Edward Collins (December 3, 1922 – August 30, 1989) (born Joseph Edward Kollonige) was an American Major League Baseball player, born in Scranton, Pennsylvania. On September 25, 1948 he began his major league career playing for the New York Yankees. He played in 10 Major League seasons and seven World Series, all for the Yankees. At 6'0" tall and 185 pounds, he batted left and threw left, which made him unavailable to play most infield positions, where he was a first baseman in 715 games regular-season games. He also played 114 games as an outfielder, while his peak number of games played in a season was 130 in 1954. Collins often platooned with Moose Skowron. Collins hit 86 regular-season home runs, but more importantly, four in the World Series with powerful Yankee teams. He was a teammate of both Joe DiMaggio and Mickey Mantle. His last Major League game was on September 29, 1957. His entire major league career was spent with the Yankees. He was traded to the Philadelphia Phillies at the start of the 1958 season, but he chose to retire rather than join the Phillies, thus cancelling the trade. He died in Union Township, Union County, New Jersey in 1989, and there is a small park there named in his honor. The park is located off of Liberty Avenue and also has a memorial plaque honoring him.